High member satisfaction largely comes from members’ support for a wide variety of activities such as hosting a social event, working on a project or serving on the board. Without our volunteers, our club would not be well known for its inviting and inclusive Corvette and social events. We seek your supporting a committee for one year (Jan to Dec), with the exception of the car show committee which runs May through April. You can join a committee at any time, although we try to fill all committee positions in Jan/Feb. Below is a chart and list of committees, each with a link that provides more information on what you would ‘sign-up’ for. There is also a link to sign-up electronically for a committee. You can also contact the chair person or board member the committee reports to if you have questions or want to join a committee that has filled its needed spots – all help is appreciated. 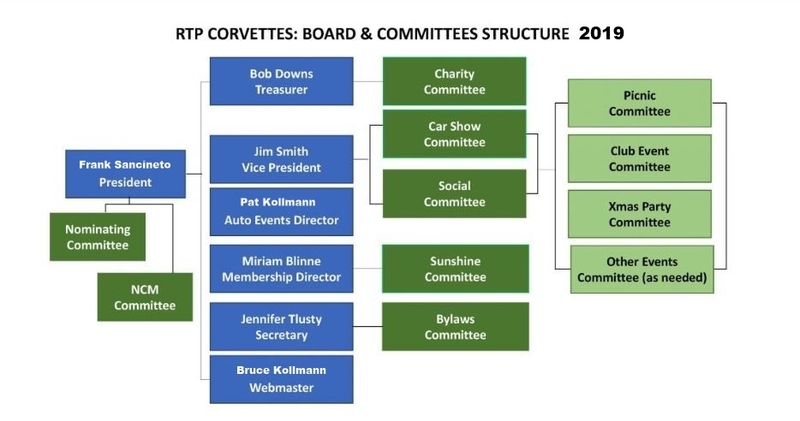 Thanks for exploring available opportunities on the links below and for making RTP Corvettes the very best! Committee Charter – details on time commitment, etc.